Obituary – Nelson, Edna “Pauline” (Munger) « Perry High School Alumni Association, Inc. Band ’45-’49; Perryscope Staff ’48-’49; Y-Teens ’46-’48; Library Staff ’48-’49. ﻿Mrs. Pauline Nelson, 50, Lucien, died at 6 p.m. Friday at Perry Memorial hospital following a lengthy illness. Funeral will be at 10 a.m. Tuesday at the Lucien United Methodist church. Officiating will be Rev. Paul Overholt. Burial will be in McGuire cemetery under direction of Parker Funeral home. Memorials may be made to the building fund of the Lucien Methodist church. 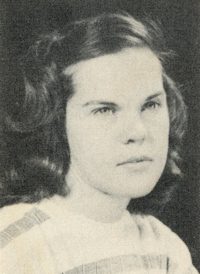 Born Jan. 30, 1930, in Perry, she was the daughter of William Munger and Edna McCracken Munger. She had made her home in the Perry and Lucien areas all her life. A 1949 graduate of Perry high school, she was married May 28, 1949, in Perry to Charles Vernon Nelson, who survives. She had been employed at the Charles Machine Works before her illness. Mrs. Nelson also was a member of the Lucien United Methodist church, member of the Agapa circle of the church, the Lucien Garden club, Lucien Square Dance club and Happy Home homemakers group. Survivors include her husband of the home at Lucien; one daughter, Mrs. Paula Duncan, Oklahoma City; two sons, Tom Nelson, Douglas, and Lon Nelson, Lucien; her father, William Munger, Perry; three sisters, Mrs. T. Jean (Donna) Reed, Tulsa; Mrs. Fred (Mary Glenn) Cochran, Castle, Okla.; and Mrs. Ann Ross, Lucien; two brothers, Bill Munger, Perry, and George Munger, Denver; and four grandchildren. She was preceded in death by her mother.